Your inner critic is telling you LIES about having to earn it. Do you try to act like everything's fine with you even (and especially!) when it's not? Do you say yes to things and wish you hadn't almost immediately after? Do you catch yourself people pleasing to the point of personal exhaustion? If the answer is yes... don't worry, you are NOT ALONE. If something looks good, it was worth the pain I put myself through. It’s selfish to have too many needs and being demanding makes me unlovable. Success isn’t an option, it’s an expectation, and failure is unacceptable. (As written in my book, Escaping perfectionism: Rewrite Your Story and Reclaim Your Life). When I achieve (X, Y or Z accomplishment, a certain social status, X amount of dollars, a level of achievement, etc. ), THEN I will be worthy of (love, happiness, success, freedom, etc.). If I were less (heavy, lazy, stupid, scattered, tied down, busy), THEN I would be more (successful, happy, attractive, loved, popular, etc.). If I were more (thin, productive, focused, motivated, etc. ), THEN I would be more (loved, popular, successful, beautiful, etc.). Those things all require EXTERNAL forces to give you the validation that should be coming from inside of you. Your achievements, your strengths, and your weaknesses are something your perfectionism completely distorts for you. Take that distortion, add your own negative mind’s guesses about what others think of you, and these Perfectionism Stories become a never-ending cycle of impossibility. See, in this PS cycle, you get the BS of there always being ANOTHER dragon to slay after your initial “victory,” which will feel incredibly short-lived, if recognized at all. It will never be enough because there will always be something MORE or BETTER you MUST achieve, be, or get rid of to be perfect and worthy of the love and happiness you thought your previous goal/attitude was going to bring you. What if you had a choice, and it included being worthy RIGHT NOW? To recognize that your inner critic is not a part of your personality AT ALL, rather a set of programmed beliefs you learned in childhood? IMAGINE WHAT IT WOULD FEEL LIKE TO LOOK IN THE MIRROR AND LOVE WHAT YOU SAW, RIGHT NOW. You're truly beautiful, and no blemish or wrinkle can come close to threatening that. Your reflection is made up of everything you are becoming, not who you once were. Your heart is in the right place and your mistakes were simply lessons. Being hard on yourself was a shield you don't need anymore. It's not only okay to ask for help, it's paramount to growing. You are worth it. And you're confident in that. You are enough. You telling yourself that is all you need. You wouldn't want to be anyone else. you appreciate being a driven person and don't think perfectionism really hurts you? Perfectionism sabotages many areas of our lives, especially these seven: career/job, money, family and friends, love, health and wellness, spirituality, and our home/office environments. On top of not being enough for everyone else, we aren't even enough for ourselves most of the time! So it's really no wonder that the 2011 Gallup-Healthways Well-Being Index said we women hit rock bottom in personal satisfaction and wellness by age 45. We start to feel the effects much earlier, but it all comes to a head because we're worn out, stressed out, and tired. We've forgotten the most important person, ourselves! They said they were getting less sleep. They reported less time for themselves. They admitted they weren’t regularly watching their own health (exercise, nutrition) because they were too busy. They often cited juggling a job, family, spouse, finances, aging parents and more as the reasons they were too busy. No matter how much they did, no matter how hard they tried or spent time in one area, it felt like it was never good enough and they felt incredibly guilty and exhausted. If this isn’t a reflection of what life will hold for a life-long perfectionist, I don’t know what is. Learned how to make yourself a priority. Created a quiet place and space just for you... with time to spare. Found gratitude in what you once saw as unforgivable flaws. Kicked judgment to the curb, about yourself and others. Enjoyed a more peaceful inner world. Felt connected to your purpose instead of your fears. Took that leap of faith backed by the power of self-trust. Joined that local Toastmaster's group, took that singing lesson, acting class, etc. With my whole heart, I welcome you to a life of more freedom and less perfectionism. The Class will be led by me, Megan Reilly, the author of Escaping Perfectionism: Rewrite Your Story and Reclaim Your Life and also a perfectionist in active recovery (both from an eating disorder and perfectionism) thanks to discovering that my professional writing was (and is) also a powerful tool for personal healing. By seeing my story through a healthier lens and rewriting it from a place of being enough, I've changed my life so much that I hardly recognize it, in a really amazing way!. Read more about me by clicking here. I'm so excited to be presenting this to other women ready to heal because I know that my happy world and the endless possibilities I see in it could not have been possible as a practicing perfectionist. Buckle up and get ready for some quick transformation because, for 30 days, we will be conquering both our self-imposed limitations and our collective setbacks we have faced as women in this world. We'll be using writing prompts to identify and REWRITE OUR BS PSes to live fuller, happier & less stressful lives! Each week, we'll focus on one to two areas of life that our perfectionism really distorts for us. 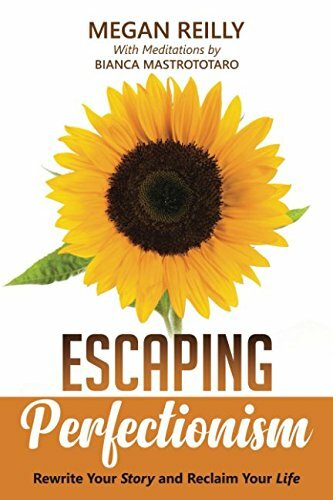 It's all based on my book, Escaping Perfectionism: Rewrite Your Story and Reclaim Your Life. A printable PDF, called The Transformation Toolkit, will be included at the beginning of each week, as well as story prompts, and of course, access to a private Facebook page where all members of the group will be invited to share as much (or as little!) as they want about their journey throughout the program. The topics that will be covered in my course have been lightly covered in my free mini-workshop series available on YouTube. Click on the links below to get a feel for what each week will look like in more detail. Support and encouragement to see perfectionism-driven stories in a more empowering light is the ultimate goal. From this place, positive changes are inevitable. To get the most out of this program, there is no set 'do-or-die' list (as perfectionists, we've all given ourselves enough of that). You only need to bring an open mind ready to push through resistance and an open heart excited to accept new possibilities. No matter where you're at on your recovering from perfectionism journey, I've created a safe space for you and the other participants so that everyone can bring the kind of vulnerability we all need to make powerful personal change. Feel good about signing up because just by setting the intention to rewrite your limiting Perfectionism Stories, you're changing your life! The Perfectionism RX Program is currently being offered at ONLY $197, or two monthly payments of $99! For only two digits you can join a group of women ready to heal and begin your recovery! I did this because I want every woman who is ready to heal to be able to take this course! This INCLUDES a FREE COPY of my book, Escaping Perfectionism: Rewrite Your Story and Reclaim Your Life, including shipping *a $20+ value for no additional cost*. The moment you sign up, you will be emailed for your address to have it sent to you. Please respond ASAP, because Amazon delivery times for individual books can vary based on their current print load for the book. Class starts Dec. 1, 2018! It’s not too late to make 2018 the year that changes for you, starting with the way you talk to and about yourself. I'll be there with you every step of the way!